Today, Dürnstein, with fewer than 1,000 residents, is one of the most popular tourist destinations in Austria’s picturesque Wachau Valley, famous for the quality of its wines and apricots. 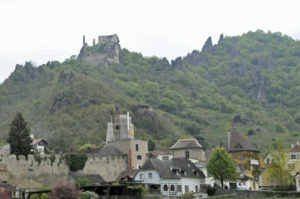 A sign on a street leading into town encourages people to climb the hill to the ruins of Dürnstein’s castle, where they can get a great view of the valley and learn the story behind the imprisonment of Richard the Lionheart. The sign notes that Leopold, called “the Virtuous,” was not able to spend the ransom money very long because, soon after being excommunicated by the Pope for kidnapping a fellow Crusader, he “fell from a horse and died unexpectedly.” In fact, Leopold died from gangrene after ordering one of his servants to hack off his broken foot with an axe.